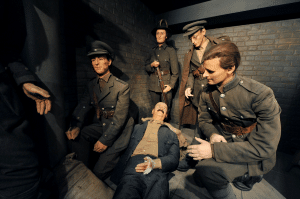 The Time vaults of Irish History offers the visitor the opportunity to explore the various stages of Irish history through a wonderful experience of sight and sound. This passage of time through the magnificently original old Armoury vaults which formally housed Ireland’s gold and armour, offers the visitor a truly unique look at Irish life in a very distinctive setting. 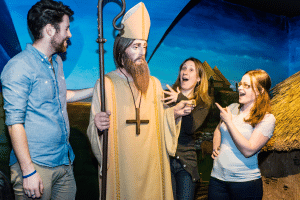 You can visit St Patrick and take a historical step through the time vaults, through the Celts, The Normans, Famine, all the way through to Modern Irish History. The Time Vaults of History offers to take you on a journey through the most notable moments of Irish history intertwined with an introduction to our mythological legends. Follow these passages of time through the magnificent old Armoury rooms which originally used to house Ireland’s gold and arms store. The narrow tunnels of time add to the sense of history and discovery, offering each visitor a unique look at Irish life in a very distinctive setting. Each Vault room allows you to get up close and personal with some of the very different figures who feature prominently in the history of our nation. Meet Setanta and his wolfhound, watch out for the Viking slaying monk, witness a glimpse of the devastation of famine life, feel the tension of the 1916 Rising and meet the men and women who secured peace in Northern Ireland. 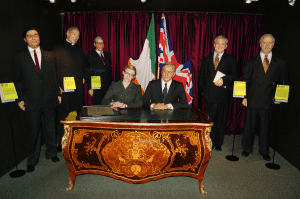 Enjoy a history lesson in Irish culture and life, from the Bronze Age right up to the Good Friday Agreement peace talks in Northern Ireland, and stand side by side some of our nations most famous historical figures. Are the Time Vaults Suitable for school & educational tours ? Yes, the Time Vaults are perfect for school tours of all levels and stages. It give a snapshot of Irish History & Mythology down through the ages. We also offer work sheets for different stages in the educational cycle to students to do pre-visit, during the visit & post visit.